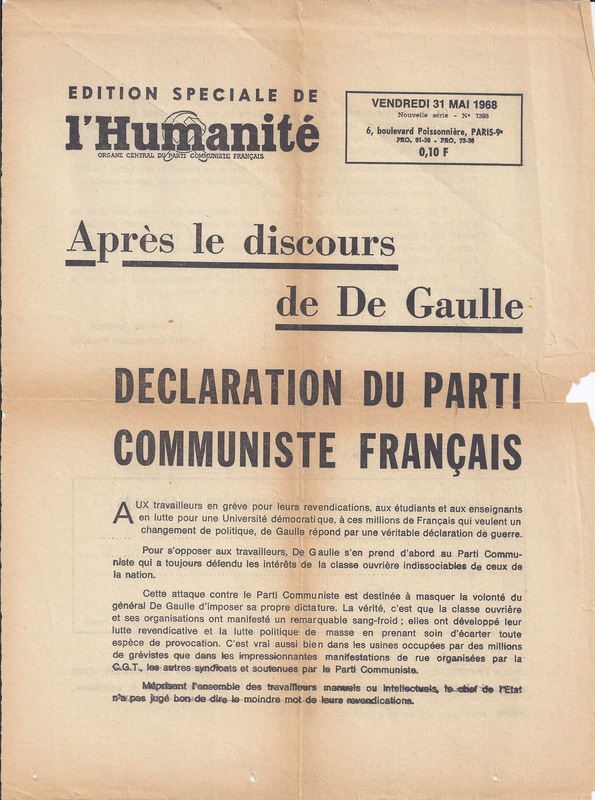 the Gaullist Régime is Responsible! Right in the middle of the preparation period for the exams, the Sorbonne and the faculty at Nanterre are closed and police repression is on the rampage. 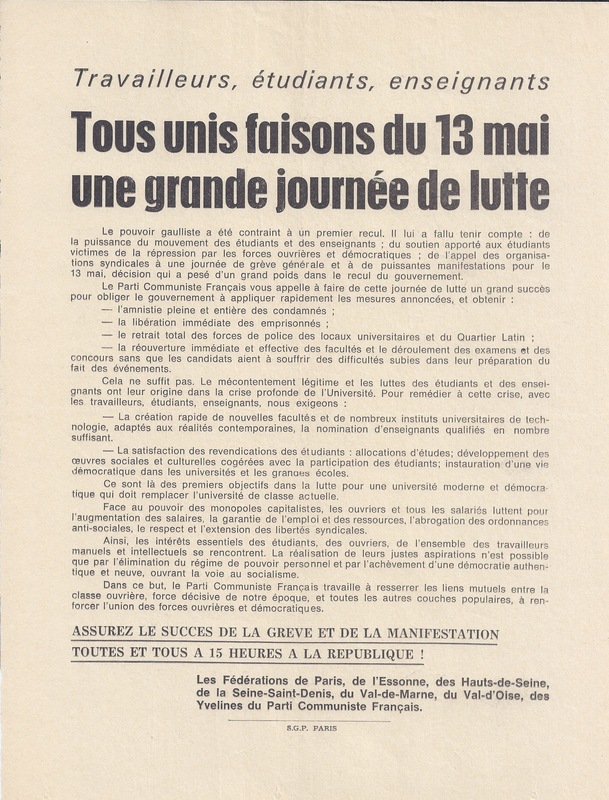 Responsibility for this situation lies at the door of the Gaullist régime which, for ten years, has been maintaining and aggravating an educational system which is ill-adjusted to our times, in its operation and its methods. Yesterday, the Minister of Education himself declared that there were only 10 per cent of workers’ children amongst the students. Three out of four students cannot finish their studies. And it is still against the students that the government strikes. The students’ discontent is legitimate. Besides, this situation favours the actions of adventurers whose ideas open no horizons for the students and have nothing in common with a truly progressive movement looking towards the future, with a truly revolutionary movement. •	the liberation of the prisoners. United democratic forces can impose these measures. To this end manual and intellectual workers, in solidarity with the students, will extend their action in different ways and will increase their resolutions and delegations to the Ministry of Education. •	the appointment of a sufficient number of teachers. 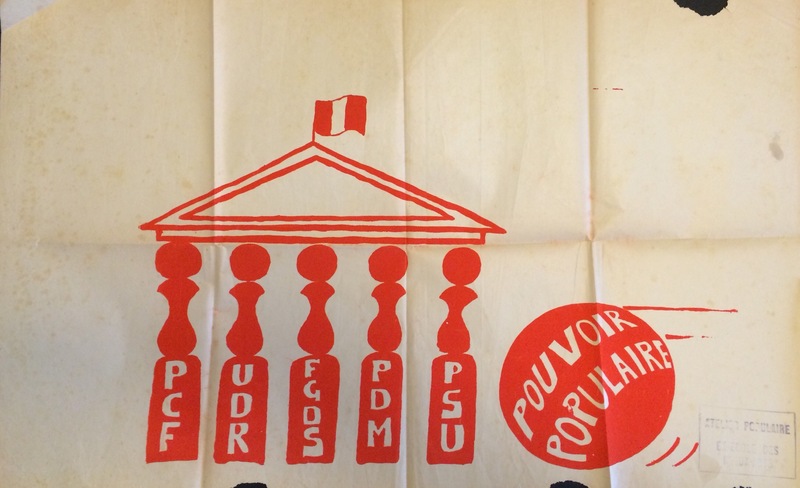 In this struggle the students will continue their action for the awarding of scholarships and for the installation of democratic life in the faculties and in the grandes écoles. These are the first aims of a movement which will lead to a true democratic reform in teaching. 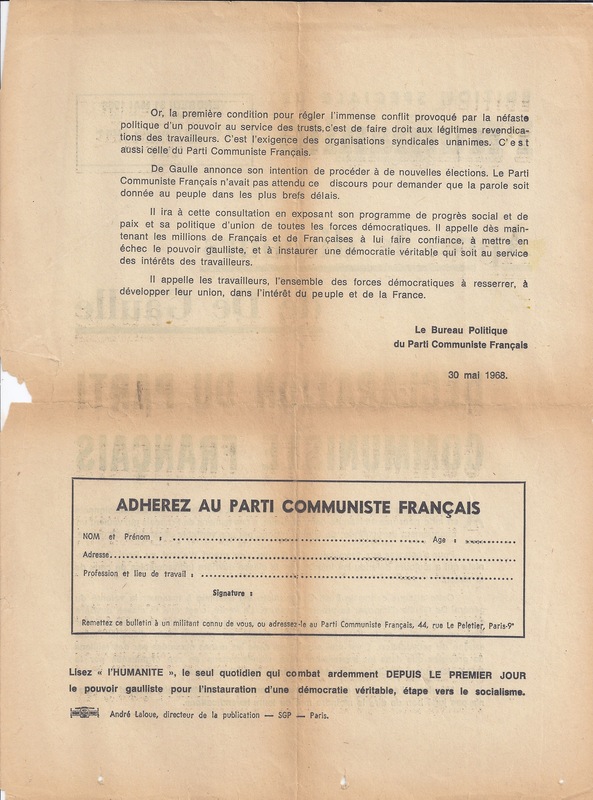 The French Communist Party is fighting for the disappearance of capitalism and the realisation of socialism in France. Consequently it is struggling for a new democracy which will guarantee profound changes, notably in the university and in teaching. SATURDAY MAY 18 at 1P.M. The events which are unfolding in both the University and in the Working Class express the profound dissatisfaction that has accumulated over ten years, directed against anti-social and reactionary policies and a state in the service of big capital. The Workers’ struggle experiences new developments every hour. 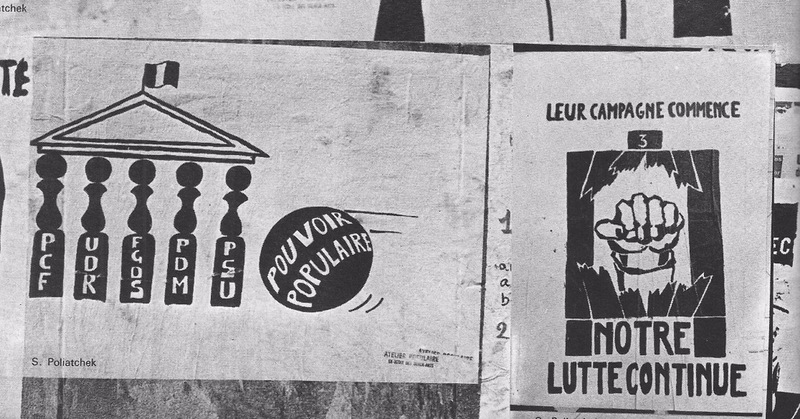 The French Communist Party reaffirms its total solidarity with workers fighting for their claims, as it has asserted with the students’ struggle for a modern and democratic University. Both workers and unions demand increases in wages, the immediate revocation of the orders on Social Security, the guarantee of full employment, reduction of working time and the extension of trade union freedom. It is essential to meet the most pressing demands of the workers. The current events constitute the condemnation of the Gaullist government and its policies. It is high time to bring this government to an end and to promote a genuine democracy which can open the way to socialism, and act in the interests of the people and the Nation. 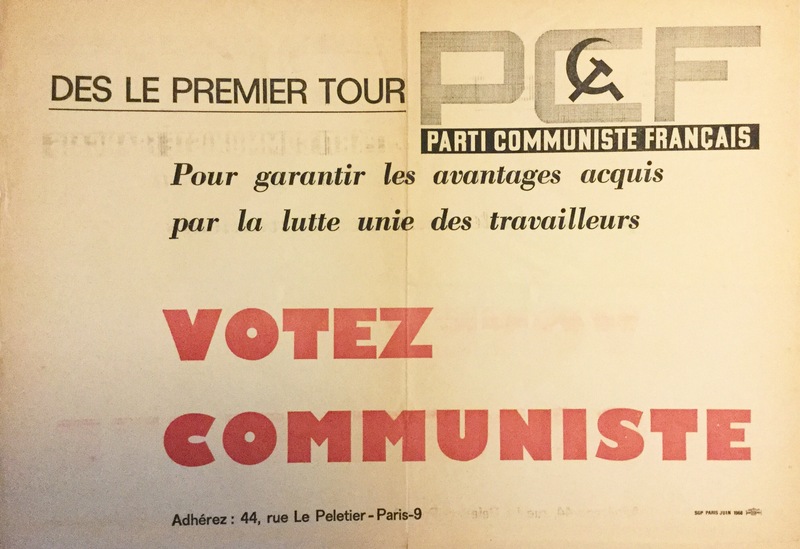 For the achievement of these objectives the French Communist Party considers it imperative to reach an accord on a socially progressive programme between parties of the left and trade unions, by majority agreement. We believe this program should provide for the application of far-reaching reforms to shield the state from the grip of capitalist monopolies, and for the implementation of a plan for economic and social development to progressively meet the demands of both blue- and white-collar workers. These reforms should aim to involve citizens in decisions affecting the economic, political and cultural life of the country. It is time to plan for the establishment of a popular government and a democratic union. 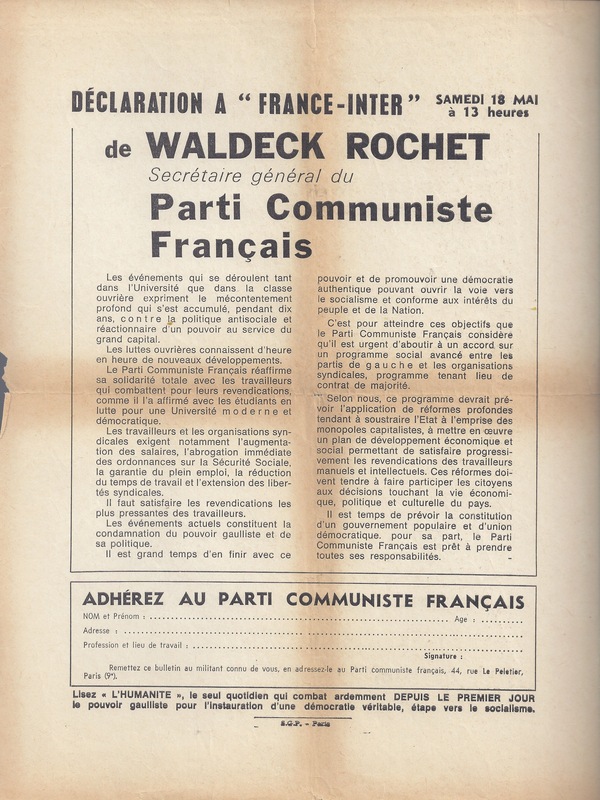 For its part, the French Communist Party is willing to take on it’s full responsibilities.